Hey Down Unders! Hope you're having a good week. SO. 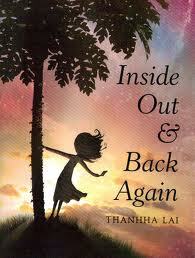 One of the books I picked up from the library a few weeks ago was Inside Out and Back Again by Thanhha Lai, published by HarperCollins. I started it around midnight thinking, I'll just read a few pages. Ha! No. That so did not happen. I was up til two in the morning because I just couldn't stop reading. It was beautiful. It was touching. It was instantly grab you round your middle and pull you in. BUT, before I continue, I want to point out the illustrators and creators of the jacket cover: Zdenko Bašić and Manuel Šumberac. The reason why I picked up this book was because ONE) The title sounded intriguing, and sounded like a book I would like. TWO) the cover art was beautiful and purpley and I already sympathized with the main character because of the way the girl was depicted on the cover. I couldn't see the face or attributes of the girl - she's all in shadow, but I wanted to. These two illustrators did a fantastic job of conveying the emotional aspect of this book though the jacket illustration. As for the story: It's the story of a Vietnamese girl who has to leave Vietnam and comes over to America because of the war going on, ending up in Alabama. It's told in free verse, being concise, impactful. Telling it through verse instead of prose allows the emotion of the piece jump through. The moments where the girl is struggling with American words and culture is revealing. There's a moment where she says something along the lines of, she wanted to go back to Vietnam where she was smart, and not an idiot like she seemed to be in America. *Oh! And here's a video of the author reading from her book.